Nate West Named ASC East Division Men’s Basketball Co-Player of the Week. 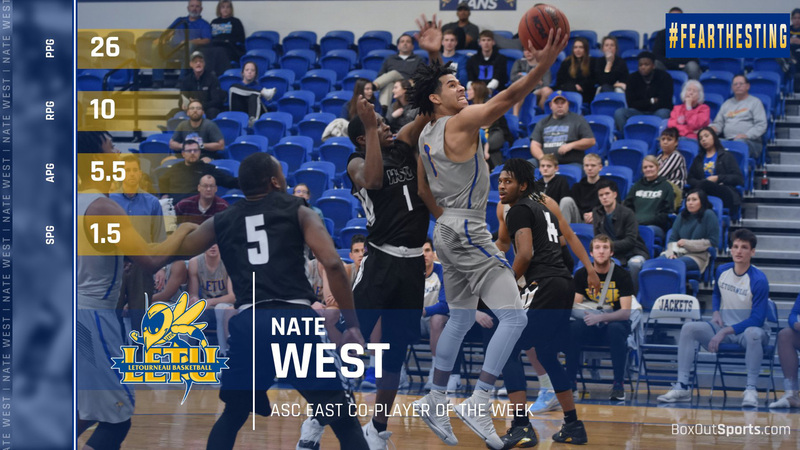 RICHARDSON, Texas – For the fourth time this season and seventh time in his career, LeTourneau University junior guard Nate West, has been named American Southwest Conference East Division Co-Player of the Week for his performances during the week of the February 4-10. West added to his ASC-leading scoring average by scoring 26.0 points per game to go with 10.0 rebounds, 5.5 assists and 1.5 steals per contest in the Yellow Jackets’ two wins. In a 91-77 victory at Louisiana College, he posted 25 points, four assists, and eight rebounds while playing all 40 minutes. The Houston, Texas native followed with 27 points, 12 boards and seven assists in a 101-78 win at Belhaven. Majoring in business at LeTourneau University, West is the son of Anna and Nathaniel West. Letourneau Men’s Track Improves Marks At Central Oklahoma Alumni Invitational. 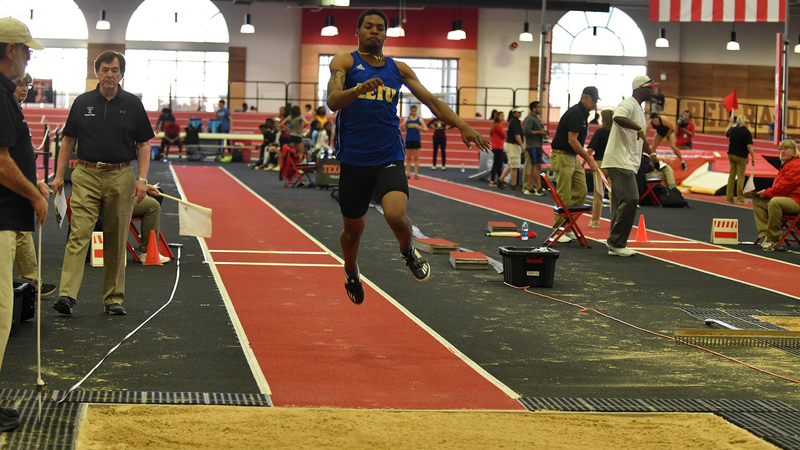 NORMAN, Okla. – Turning the calendar to the final month of action in hopes of recording national qualifying marks, the LeTourneau University men’s track and field team would continue to show improvement. They are setting new top targets at the University of Central Oklahoma Alumni Invitational at the Mosier Indoor Track and Field Facility on the campus of the University of Oklahoma on Saturday, February 9. Winning their respective events would be Alex Hindman in the Pole Vault (4.70 meters, 15 ft. – 5 in. ), Colton Pounders in the 60 meter hurdles (9.06), and the Distance Medley Relay team consisting of Wesley Anderson, Arvin Hrushka, Dalton Heichelheim, and Lorien Nightingale with a time of 11:14.81. Coming away with a third-place finish in the long jump would be Stanley Williams with a mark of 6.67 meters (21 ft. – 10.75 in.) before taking seventh in the 60 meters (7.10) while Collin Jones (4.40 meters, 14 ft. – 5.25 in.) and Hrushka (3.35 meters, 10 ft. – 11.75 in.) would take third and fifth in the pole vault. Earning a fourth-place finish in the triple jump would be Nate Berlandier with a mark of 12.75 meters (41 ft. – 10 in.) before going on to compete in the long jump (5.55 meters, 18 ft. – 2.5 in.) while Hrushka would go on to take sixth in the 60 meter hurdles (10.25). Other top-eight finishes for the YellowJackets on Saturday afternoon would be the 4×400 meter relay team of Jones, Pounders, Heichelheim, and Hrushka with a time of 3:36.52, Nightingale in the 800 meters (2:05.30), and Jones in the long jump (6.11 meters, 20 ft. – 0.5 in.). Finishing with a top-10 finish by taking ninth, Keishaun McMillian would run a time of 10.96 in the 60-meter hurdles and also compete in the high jump but would be unable to record a mark before going on to compete in the shot put (10.28 meters, 33 ft. – 8.75 in.). Competing alongside McMillian in the shot put would be Judson Iverson who would record a mark 9.52 meters (31 ft. – 3 in.) before going on to compete in the weight throw (9.25 meters, 30 ft. – 4.25 in.) with Adrik Kling (9.51 meters, 31 ft. – 2.5 in.). Other competitors for LeTourneau in events would be Wesley Anderson (2:11.08) and Nathan Glastetter (2:12.19) in the 800 meters while Daniel Lopez (10:22.29) and Jared Rose(10:55.37) competed in the 3,000 meters. Next up for LETU will be the Texas A&M Twilight Meet in College Station, Texas on Saturday, February 16th. The meet will serve as the final regularly-scheduled indoor meet for the YellowJackets before turning their focus towards the outdoor season. LeTourneau Women’s Track and Field Records Nine Top-10 Finishes At Central Oklahoma. NORMAN, Okla. – Traveling North and outside of the Lone Star State, the LeTourneau University women’s track and field team would record nine top-10 finishes at the University of Central Oklahoma Alumni Invitational at the Mosier Indoor Track Facility on the Campus of the University of Oklahoma on Saturday, February 9. No team scores were kept for the meet and featured a mix of schools across associations and divisions. Earning fourth-place finishes to lead the YellowJackets would be Riley Blok in the high jump (1.40 meters, 4 ft. – 7 in. ), Kaylee Packer in the pole vault (2.90 meters, 9 ft. – 6.25 in.) and Alexis Segura in the mile run (5:27.99). Segura would go on to take sixth in the 3,000 meters later in the day with a time of 11:13.58, while Kennady Poling would take sixth in the pole vault (2.75 meters, 9 ft. – 0.25 in.) and Tori Field would take sixth in the triple jump (10.19 meters, 33 ft. – 5.25 in.). Going on to take seventh in the long jump with a mark of 4.74 meters (15 ft. – 6.75 in. ), Field would also take ninth in the 60 meter hurdles (10.50) to finish her day with top-10 finishes in all three events she competed in while Rebekah Stevenson also earned a top-10 finish by taking 10th in the weight throw (10.70 meters, 35 ft. – 1.25 in.). Stevenson also competed in the shot put and recorded a mark of 8.92 meters (29 ft. – 3.25 in.) while Alicia Griscom recorded scores of 9.95 meters (32 ft. – 7.75 in.) in the weight throw, and 5.93 meters (19 ft. – 5.5 in.) in the shot put. In addition to the sixth-place finish from Segura in the 3,000 meters, LETU would also see Victoria Hood (12:01.96), McKenzie Craycraft (12:33.40), Allison Fuller (13:04.72) and Bridey Davis (14:01.07) compete in the event with Hood also competing in the mile run (5:49.34). Lexi Funk would just miss out on a top-10 finish in the 60-meter hurdles and run a time of 10.93 and 1:08.23 in the 400 meters while Poling would run a time of 1:12.87 in the 400. Other results for LeTourneau in the meet saw Ro Galloway (8.45) and Kristyn Matthews(8.58) run in both the 60 meters and 200 meters (27.75 for Galloway, 29.57 for Matthews) and Georgiana Roeder record marks of 10.85 in the 60 meter hurdles and 1.44 meters in the high jump as part of the pentathlon. 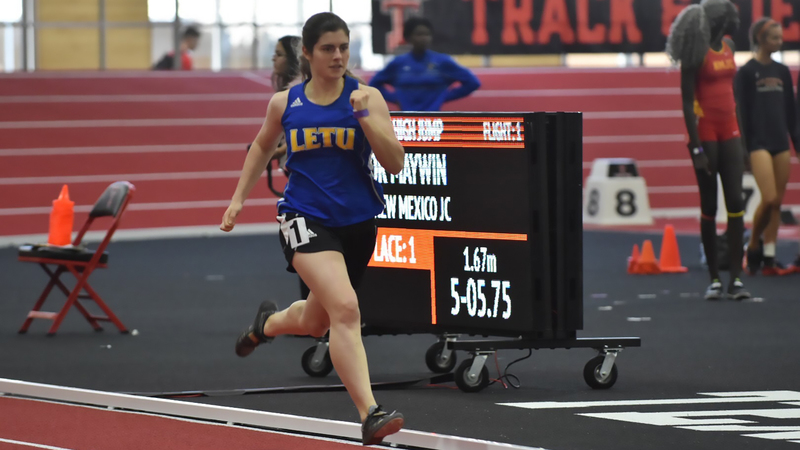 Returning back to East Texas, LETU will be in action on Saturday, February 16 when they compete in the Texas A&M Twilight Meet in College Station, Texas. LETU Softball Opens 2019 With Sweep Of Schreiner. 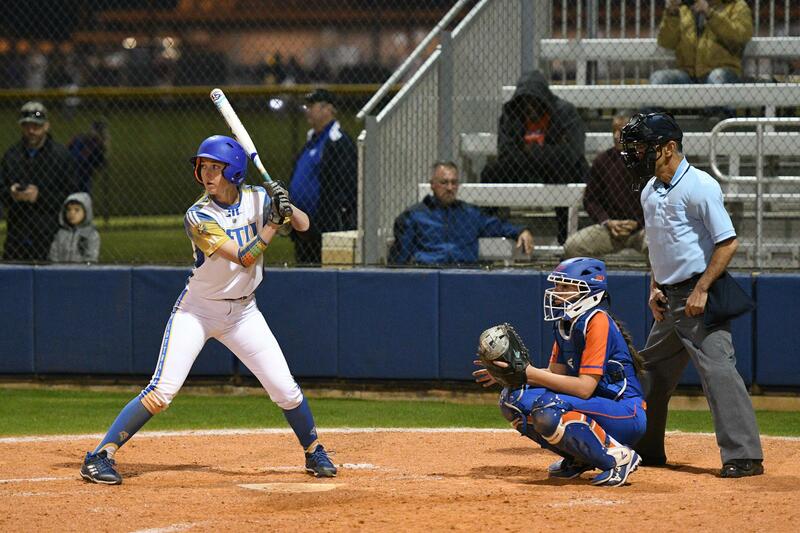 LONGVIEW, Texas – Hot bats would be the difference maker for the LeTourneau University softball team as they kicked off their 2019 campaign with a pair of victories against non-conference opponent Schreiner University at the LETU softball field on Saturday, February 9. Following the wins, the YellowJackets sit at a perfect 2-0 on the season while the Mountaineers drop to 2-6 on the year. LETU freshman Bailey Richey would allow two runs in the top of the first before her defense would help end the threat and give the YellowJackets their first chance on offense. LeTourneau would answer in the bottom of the first when a sacrifice fly from Haydn Parker would bring in the first run of the year for the YellowJackets by scoring Kennedi Dillow. An inning later, Hana Bonner would knot the game at two with a solo home run over the center field wall to lead off the bottom of the second. The YellowJackets would use four hits in the bottom of the third and the help of Parker’s second RBI of the day to give them their first lead of the day at 3-2 to drive in Dillow for the second time in as many tries. Looking to add to their lead, LeTourneau would do just that in the fourth as they tacked on two more runs off a Mountaineer wild pitch and Parker RBI double. Center fielder Katelyn Trombley would threaten the Schreiner defense once again in the fifth as she launched a two-run homer to extend the LETU to an 8-2 lead heading into the sixth as the YellowJackets would appear to be in full control of the game. Schreiner’s bats would come alive in the sixth as they recorded four hits and would use a grand slam to cut the deficit to one as they trailed 8-7 heading into the bottom of the sixth. Following a 1-2-3 bottom of the sixth, LETU would be tasked with holding the Mountaineers scoreless in the top of the seventh but would fail to get the job done as SU knocked in two runs to reclaim the lead at 9-8 and force LETU to need a run in the bottom of the seventh. With their backs against the wall, LETU would draw a one-out bases-loaded walk to tie the game after putting all three runners aboard following a leadoff flyout. A would-be walk-off single would be caught on a diving effort in left field which turned into a double play to send the game into extra innings. Using the international tiebreaker rule, the YellowJackets would stand tall and hold the Mountaineers scoreless in the top of the eighth by cutting down the runner placed on second at home plate on a fielder’s choice with one out. Ashley Crawford would seal the deal in the bottom of the eighth as she singled up the middle to score Trombley who would start the inning by being placed on second as part of the tiebreaker rule and secure the extra-innings win for the YellowJackets. LeTourneau’s defense would show signs of nerves in their opening game as they committed four errors in less than ideal weather conditions while Schreiner would only have two. Both teams would record 13 hits in eight innings of play while Dillow would walk away with a team-high three for the YellowJackets. Samantha Akers would mark her first win of the year after taking over for Richie in the fifth inning and throwing three innings of work while allowing two runs (zero earned) and striking out three. Game two would be a defensive battle from the start as the teams would see just five hits combined and zero runs through 2.5 innings of play. It wouldn’t be until a two-out triple from Trombley that the YellowJackets would take a 2-0 lead in the bottom of the third where the score would stand until the bottom of the fifth. Parker would carry her hot bat into game two as she tacked on another RBI for the day, scoring Macey Mize from second base to make it 3-0. Adding to their total, the YellowJackets would wake up in the sixth as three consecutive hits to the right side of the field would bring in three more runs for LETU to give them a comfortable 6-0 lead. SU wouldn’t go down without a fight as they would load the bases in the top of the seventh to force an LETU pitching change. Akers would shut down the Mountaineer threat as she allowed just one run and allowed the YellowJackets to take a five-run victory. Junior pitcher Leigh Luker would get the win for the YellowJackets as she allowed zero runs in six innings of work. Errors would haunt the Mountaineers as they recorded three while the LETU defense would manage to limit their miscues to just one. A trio of YellowJackets in Dillow, Mize, and Banks would each record a team-high two hits as they combined to collect six of LETU’s ten. LETU will look to continue their success as they travel to Abilene, Texas for their first American Southwest Conference series of the year against McMurry University on Friday, February 15. The War Hawks will enter Friday’s doubleheader with a 5-3 overall record while hoping to snap a three-game losing streak. Seventh-Inning Spurt Downs LeTourneau Baseball 8-4 At Millsaps. JACKSON, Miss. – After cutting a 4-1 deficit to a single run in the top of the seventh, a four-run bottom of the seventh for Millsaps University would be too much for the LeTourneau University to overcome in an 8-4 road loss at Twenty Field in Jackson, Mississippi on Saturday, February 9. 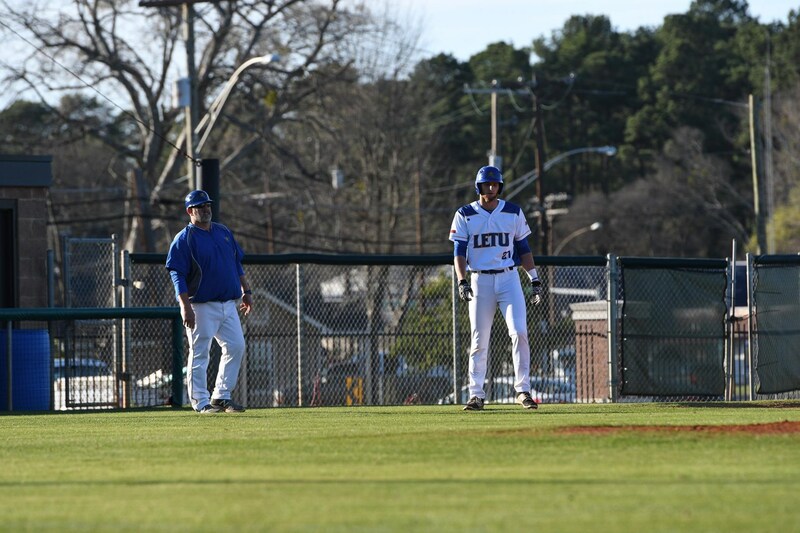 LETU is now 0-2 on the season after suffering their second loss in as many days on the opening weekend of the 2019 season while the Majors improved to 1-0 with a win in their season opener. Grabbing an early lead, the YellowJackets would utilize a leadoff single from Lee Hosie who would come around to score on a Will Bradshaw RBI double down the left field line. Turning his efforts to the pitcher’s mound, Bradshaw would come out and retire Millsaps to give LETU a 1-0 lead after one inning of play as LeTourneau would be unable to capitalize on a point off hit in the top of the second. A leadoff home run for the Majors in the bottom of the second would tie the score at 1-1. Millsaps would later threaten to take their first lead of the game before seeing the go-ahead run at second get picked off to end the inning. Not much would be seen out of LeTourneau in the top of the third, allowing for Millsaps to get back up to bat as the Majors would use a two-run home run with two outs to grab a 3-1 lead heading to the fourth. Neither team would do much of anything in the fourth to send things to the fifth inning where LETU would see a pair of one-out singles get stranded as a pop out and fly out would end the threat without seeing the YellowJackets cut into their two-run deficit. Using a one-out double to put a runner in scoring position, Millsaps would use a fielder’s choice and throwing an error to plate a run in the bottom of the fifth and grab a 4-1 lead and send things to the sixth inning. Making the most of their one hit in the top half of the sixth, the YellowJackets would plate one-run with a solo home-run from Noah Mahoney and hold the Majors scoreless to put the deficit back at two heading to the seventh. A solo home-run for the second straight-inning would pull LeTourneau within a single-run as Cody Lee would lead things off with a four-bagger to force a Millsaps pitching change. The change on the mound would prove to be useful as the YellowJackets would go down in order after the move and be unable to cut into the Major despite gaining new life by reducing the lead in half. Two straight bunt singles to start the bottom of the seventh would allow Millsaps to threaten to extend their lead as a sacrifice bunt would move the runners to second and third before an intentional walk would load the bases. A hit batter would bring home a run for Millsaps and would be followed by an RBI single for the Majors and sacrifice fly to drive in two more runs and push the lead to 7-3 with two outs. Millsaps would manage to score one more run on an RBI to take their largest lead of the afternoon at 8-3 and leave LETU with work to do and just six outs to work with. Putting two runners on with just one out, LeTourneau would once again be shunned by the Majors as a groundout and flyout would see the YellowJackets come up empty-handed and put back on defense. Stellar defensive plays by LETU would keep Millsaps from extending their lead as a strikeout would be followed up with the final two outs of the inning-ending on the base paths for the Majors. Trying to spark a late rally, Brueggemeyer would hit a one-out double and advance to third after Eli Birriel would reach base on a fielding error to bring up Hosie who would hit into a fielder’s choice but bring home a run. Down to their final out, LETU would be unable to make any more noise and see a flyout end the game. Serving in a starting role on the mound for the first time after playing as a reliever last season, Bradshaw would take the loss following five innings of work and allowing four runs (one earned) on six hits while striking out five. At the plate, Bradshaw would go one-for-three with a double and RBI. Jacob Steinman (1.1 innings) and Konner Gayle (1.2 innings) would split the final three innings on the mound and combine to strike out three. 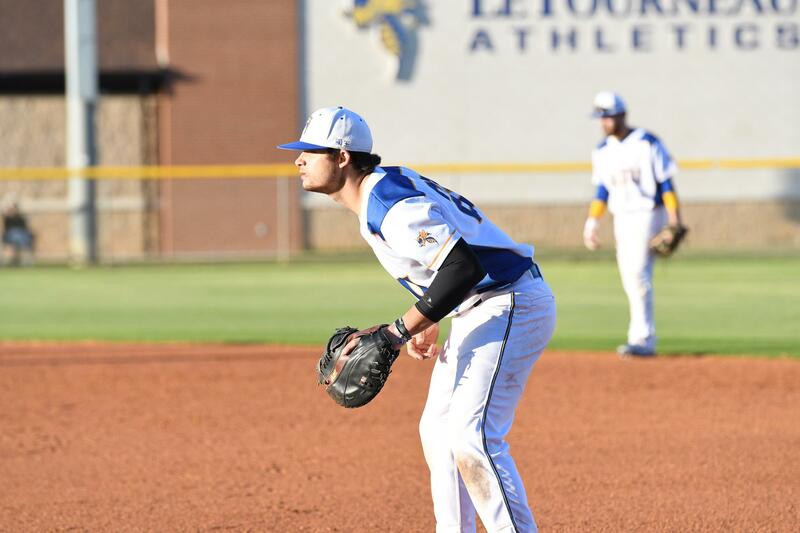 Collecting two of LETU’s eight hits, Bryce Brueggemeyer would finish as LeTourneau’s only player with multiple hits in the game which included a double in the ninth. LeTourneau will return to Smith-Wills Stadium on Sunday, February 10 to close out the Belhaven-Millsaps opening weekend tournament with a 12:00 pm neutral-site contest against Rhodes. The Lynx will enter Sunday’s match following two games on Saturday to open their season as Rhodes fell 7-6 in 11 innings to Belhaven and did not have their contest against Maryville College completed at the time of this release. LeTourneau Men’s Basketball Wins Road Finale At Belhaven 101-78. JACKSON, Miss. – Needing a victory to keep their ASC East Division Title aspirations alive, the LeTourneau University men’s basketball team would use a 57 percent shooting performance from the field to break open an 11-point halftime lead and cruised to a 101-78 victory over Belhaven University at Rugg Arena in Jackson, Mississippi on Saturday, February 9. Improving to 16-7 overall, LETU is now 10-4 in the American Southwest Conference while the Blazers slipped to 8-15 overall and 2-13 in ASC play. Quick paced action would get the game going as sophomore Justin Moore would score the first five points for the YellowJackets while seeing Belhaven match his efforts to tie things at 5-5 1:44 into the game. The back-and-forth would continue as the Blazers would take a 7-6 lead on a Jonathan Durham layup but see Andrew Eberhardt respond with a layup of his own as LETU would briefly grab a 10-7 lead before a Belhaven triple tied the score once again. Five more ties would be had over the next four-plus minutes of action before Elijah Gerber broke a 20-18 deadlock with his fourth-straight point as the YellowJackets used a 7-3 run to take a 22-18 lead. The rest of the first half would see LETU expand upon their lead and go up by as 14 in the opening 20 minutes of action and eventually settle at 53-42 in favor of LeTourneau. 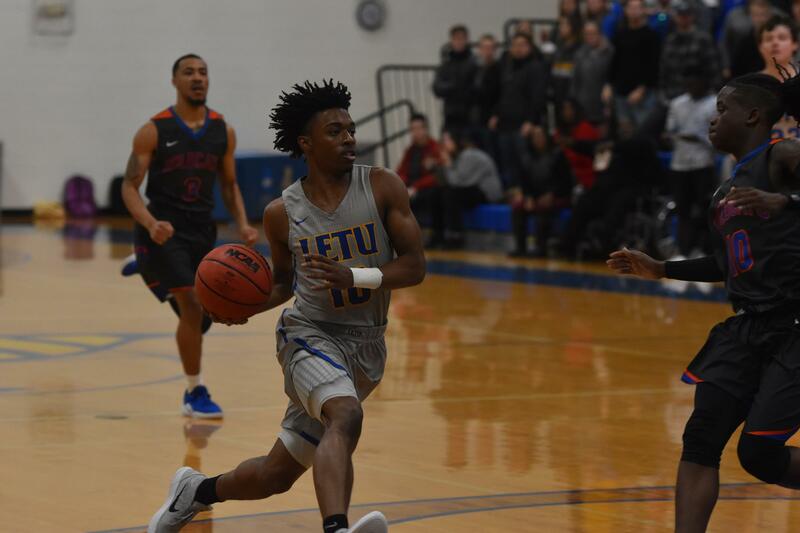 In similar fashion to the beginning of the game, both the YellowJackets and Blazers would open the second period by matching each other point for point as LETU would maintain their double-digit lead throughout the opening five minutes of play. The YellowJacket lead would reach 19 at 67-48 with 14:36 left in the game before a 7-2 Belhaven dash closed the gap to 13 just 90 seconds later. Momentum for the Blazers would continue as the deficit would be cut to 10 on a Justin Jones layup with 11:03 remaining in the second half but it would be LeTourneau who would, in turn, go on an 11-1 run to grab their first 20-point lead of the game ta 83-63. The final five minutes of play would see the YellowJackets keep the defensive pressure on as BU would only manage to cut the lead back down under 20 just once which would allow LETU to grab a win in their last regular-season road game. 92 of LeTourneau’s 101 points would come either in the paint or via fast break as LETU would take full advantage of Belhaven’s 10 turnovers. The rebounding edge would also see LETU hold their own as the YellowJackets grabbed 34 rebounds including nine offensive rebounds compared to just 31 for Belhaven. Leading LeTourneau on offense was junior Nate West with a 27-point, 12 rebound performance for a double-double while Moore added 21 points and three assists. East Texas Baptist University makes their way to Solheim Arena to take on LeTourneau for a 7:30 pm. contest on Tuesday, February 12. ETBU is 12-11 overall, and 8-6 in ASC play after dropping an 81-76 road decision to Louisiana College Saturday afternoon. LeTourneau Women’s Basketball Spoils Belhaven Senior Day, Wins 61-58. JACKSON, Miss. – After building a 19-12 lead the first 10 minutes of play, the LeTourneau University women’s basketball team managed to fend off a late rally from host Belhaven University for a 61-58 victory at Rugg Arena in Jackson, Mississippi on Saturday, February 9. LETU earns the season sweep over Belhaven to improve to 6-17 overall and 3-11 in the American Southwest Conference. The Blazers fall to 7-16 overall and 3-12 in ASC play following the loss. Belhaven would look to utilize the momentum of senior day as the Blazers would score eight of the first 11 points of the contest to open an 8-3 lead with 5:35 left in the first quarter. Chauntel Acosta and Keauna Whitfield would bring the YellowJackets back with an 8-0 run in a span of 1:06 to take an 11-8 lead before seeing an Alexis Caldwell layup pull BU back within one at 11-10. LeTourneau would respond with an Alexandria Thorne triple to go back up four at 14-10 as the YellowJackets would close the first quarter on an 8-2 run to open a seven-point lead heading to the second quarter. After a Whitfield layup to open the second period, Belhaven would use a six-point spurt to close within three before Acosta would answer with her latter three of the game to put LETU up 24-18 midway through the quarter. The YellowJackets would take their largest lead of the half at 30-21 with 41 seconds remaining before seeing the Blazers score the final three points of the half to cut the deficit to 30-24 at the break. Seven of the first nine points of the second half would be scored by Belhaven to cut the YellowJacket lead down to a single point at 32-31 before seeing both squads go back and forth in the scoring column with the Blazers eventually grabbing a 35-34 lead. Thorne would look to get her team back in the game by scoring the next five LeTourneau points and allowing LETU to reclaim the lead at 39-37 before an Olivia Eweni layup put LeTourneau back up four with 2:30 left in the third. The LETU run would continue with five more Thorne points to allow LeTourneau to match their largest lead of the game yet again at 46-37 and hold a 46-38 lead heading to the fourth. 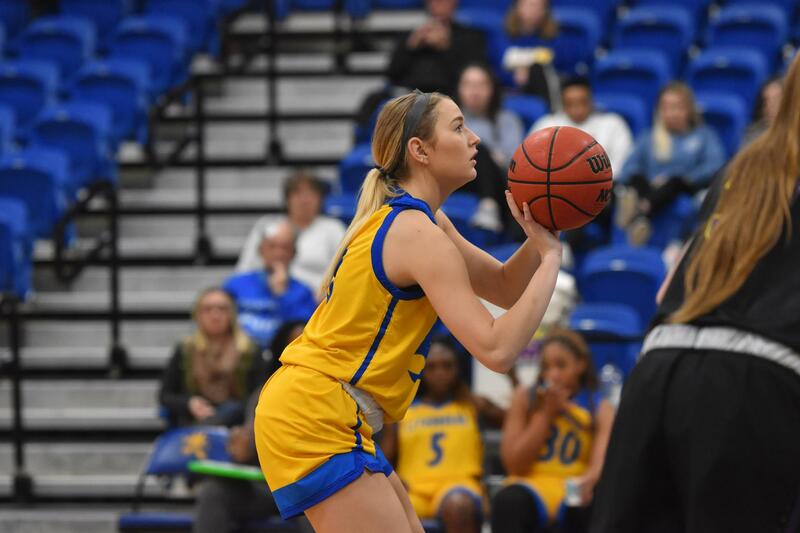 A back-and-forth fourth quarter saw LETU stave off numerous Belhaven rallies as neither team could score more than three points in a row over the first seven minutes of the quarter. Whitfield would put LETU up seven at 54-47 with 3:32 remaining as the Blazers would be unable to get closer than two points in the final minute as free throws would allow LeTourneau to escape with the victory. The 18-11 advantage in bench points for LeTourneau helped the YellowJackets overcome a 19-8 lead in second-chance points as LETU would connect on 44.2 percent (23-of-52) of their shots from the field. Sixteen of LeTourneau’s bench points would come from Madison Mayfield (nine points) and Sha’Donnaver Young (seven points) as Thorne would lead the team with a game-high 17 points and eight rebounds. Whitfield (13) and Acosta (10) also managed to reach double-figures in the scoring column, with Whitfield grabbing five rebounds and adding three assists. LeTourneau gets a chance to close out the regular-season at home beginning Tuesday, February 12 against East Texas Baptist University at 5:30 pm. The game will serve as the second rendition of the Highway 80 Rivalry this season after facing off in Marshall back on December 13. JACKSON, Miss. – Stranding 11 runners on base, the LeTourneau University baseball team would be unable to complete a comeback in a 5-4 road defeat to Belhaven University at Smith-Wills Stadium in Jackson, Mississippi on Friday, February 8. LETU falls to 0-1 overall while the Blazers pick up a win to move to 1-0 on the season as the game did not affect American Southwest Conference standings and was considered a non-conference game. Chances throughout would find their way to the YellowJackets as LeTourneau would find themselves with runners on second and third with one out in the top of the first before a strikeout and ground out would end the opportunity to take an early lead. Belhaven managed to take advantage of back-to-back singles to open their half of the first and would eventually score a run on a passed ball before seeing two quick outs, nearly limit the damage to just one run scored. It would be a two-out RBI double however that would bring home a second run to give the Blazers a 2-0 lead after one inning of play. A two-out second-inning rally would get LeTourneau on the board as Eli Birriel would turn a hit-by-pitch and stolen base into the first run of the year for the YellowJackets on a Will Bradshaw RBI single that would move Lee Hosie to third after the senior would draw a walk before Bradshaw’s at-bat. A passed ball would then return the favor to LETU to tie the game at 2-2 after Hosie would find his way across home plate. It wouldn’t take long for Belhaven to reclaim the lead as a leadoff runner would reach on an error and would move around to third on a groundout and single to put runners on the corners with one out. Following a stolen base to put two runners in scoring position, a two-RBI double would put the Blazers back up 4-2 as BU would look to add to their lead. A passed- ball and fielder’s choice would allow the Belhaven base-runner to score and give the Blazers a 5-2 lead as a groundout would manage to end the inning and bring LeTourneau back up to bat with work to do to try and get back into the game. Both teams would then settle in on defense as both the YellowJackets and Blazers would strand a pair of runners in the third with each side going hitless in the fourth to keep things at 5-2 in favor of Belhaven. The top of the fifth would see LETU put runners on second and third with one out as Noah Mahoney would reach on a muffed throw at first before moving to third on a Jacob Jones double as the YellowJackets looked to cut into the three-run deficit. A fielder’s choice by Belhaven would cut down a run at the plate to put runners at the corners for LETU with a chance to still cut into the lead, but a groundout would end the threat as a much-needed timely hit could not be found. LeTourneau would keep moving things along in the bottom of the fifth by working around a leadoff bunt for a base hit but would be unable to get anything going in the top of the sixth as a leadoff infield single by Bryce Brueggemeyer would wind up stranded at third. Belhaven would go down in order in the bottom half of the sixth to send things to the seventh where LeTourneau would use a pair of walks to start the inning to put pressure on the Blazers once again. After a strikeout, Matt Lowery would send a ball deep to left field that would wind up being an error by the left fielder that would allow Mahoney and Cody Lee to move into scoring position before advancing one more base each on a throwing error by the Blazer third-baseman trying to throw behind Lowery at first. Brandon Ramirez would then collect an RBI infield single to bring home Mahoney and cut the lead down to 5-4 in favor of Belhaven, but an inning-ending double play would end the rally and leave LETU down one heading into the seventh-inning stretch. LeTourneau would be forced to work around a leadoff walk by seeing reliever Kolton Eberlan strike out two of the next three batters to end the inning. Facing Belhaven’s third pitcher of the day, LETU would muster just an infield single from Bradshaw in the eighth as Belhaven would get a groundout to end the inning before going down in order in their half of the eighth to maintain their 5-4 lead heading to the ninth. Down to their last three outs, a comeback would not be in store for LeTourneau as a pair of groundouts and a pop out would end the game without the YellowJackets putting the game-tying run on base. Settling in after the first two innings of play, starting pitcher Andrew Harlan would take the loss after throwing six innings of work and striking out two and did not allow a single run after the second inning of play. Eberlan would wind up throwing the final two innings in relief and striking out two of the seven batters he faced while issuing one walk. Offensively, Jones would collect LETU’s only extra-base hit of the afternoon with a double while Bradshaw and Ramirez both recorded three hits. Game two of opening weekend for LeTourneau will take place at Twenty Field as the YellowJackets will play Millsaps College at 3:00 p.m. on Saturday, February 9.